← Could Stonehenge tunnel be ‘sacred version’ of Twyford Down? 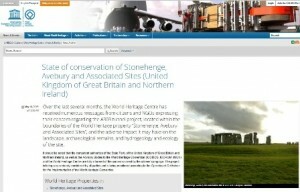 UNESCO’s World Heritage Centre has acknowledged the many messages received from citizens and non-governmental organisations about the Stonehenge tunnel proposal and has given an assurance that the relevant UK Government departments and bodies (which include Historic England (formerly English Heritage)) are also aware of our concerns. We thank our supporters for writing to UNESCO, eliciting this response which we warmly welcome. We hope that supporters, like us, will feel encouraged that the project is being monitored according to UNESCO’s Operational Guidelines for the Implementation of the World Heritage Convention. The key point made here – and in the World Heritage Convention – is that it is the whole WHS or “property” that is to be safeguarded, not just parts of it. The first Stonehenge Management Plan was published by English Heritage in 2000 and revised in 2009. This week sees the launch of the first combined management plan for Stonehenge, Avebury and Associated Sites WHS. We hope that the Government and its advisers will consider carefully its commitments under the World Heritage Convention, and UNESCO’s Operational Guidelines which provided relevant advice for the new WHS Management Plan. Re-examination of these three documents ought to lead the Government to a change of heart and a better outcome for the Stonehenge WHS than that currently proposed. To view UNESCO’s response of 19 May 2015 please click on image.